This site describes two programs that you can use to monitor and record what programs are run on your computer and what Internet sites people view on this computer. These programs are designed to allow parents to monitor and therefore protect their children and to allow employers to prevent misuse of comp nay computers by employees. Web Surfer Watcher keeps a log of what Web sites are visited, while Computer Use Reporter keeps a log of what programs are used and (to some extent) what is done with these programs. For example, Computer Use Reporter will give you some information on what Web sites are visited and what documents are viewed on a word processor. Note: Some antivirus programs have mistakenly labeled these as spyware and will display warnings when these programs are installed. This is a mistake. Although the programs do record some activity conducted on the computer, they do not transmit information over the Internet, nor do they record passwords or other sensitive information. They merely record information on what programs are used and what Web sites are visited. This information can only be viewed by reading it from the computer. Web Surfer Watcher is a software program for Windows (does not work on NT computers) that records what Web sites have been viewed on your computer to allow Internet monitoring. Web Surfer Watcher operates hidden in the background, recording Web site titles and URLs (addresses) of Web sites viewed using Internet Explorer or America Online. It can only record the titles of Web sites viewed with other Web browsers, such as Netscape, Opera, or Mozilla. You can configure Web Surfer Watcher to either record this limited information from these browsers, or block these browsers from running to force people to use Internet Explorer or America Online. When you run the viewer, you will see a list of the titles of Web sites that have been visited. The list displays the Web site titles. You can click on any title on the list to see the URL of the site, and also when the site was viewed. You can then click on the View Web Site button to actually see the Web site if you like. You can search the list of viewed sites for specific words to simplify checking for objectionable sites. Web Surfer Watcher is available as shareware ($20 individual fee, with volume discounts available). Try it for a month to see if you like it before you have to pay for it. Just download the install file to your computer, then run the file like a program by double-clicking on the install file in Windows Explorer or My Computer to install Web Surfer Watcher. Remember that complete instructions are provided for uninstalling Web Surfer Watcher if you decide that you do not like it. If you are interested in this program, contact Leithauser Resarch at Leithauser@aol.com. Find out what your employees or children are doing on the computer. Computer Use Reporter covertly monitors what programs are used on the computer, what files or Web sites these programs access, when they are accessed, and which user is on the computer at the time. Computer Use Reporter is a software program for Windows computers that records what programs are used on a computer. Specifically, it records the text in the title bars of any programs that are run on a computer. The title bar is the blue bar at the top of most windows. This title bar almost always contains the title of the program (hence the name, title bar) such as "Internet Explorer" or "MicroSoft Word". In addition, on most programs it also contains information about what file the program is currently accessing. Of particular importance is that Web browsers include the title of the Web page being viewed in that browser. 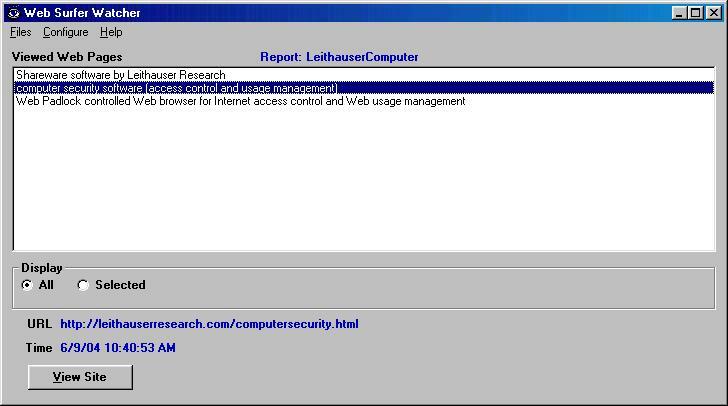 For example, if you were viewing the Leithauser Research home page in Internet Explorer, the title bar would be "Shareware Software by Leithauser Research - Internet Explorer." This means that you can track what Web sites are viewed on a computer that has Computer Use Reporter installed. Computer Use Reporter records the date and time the title bar is opened, and the date and time each time it changes. If there are several users who have access to the computer, it records which user is using the computer at the time the program is used. You can view the report on which programs were used using the Computer Use Reporter control program. This program lists the contents of all titles bars, giving the tile and date each title bar was first displayed. If you click on an item on the list, it shows you the user name of the person on the computer. Note: Computer Use Reporter cannot record activity of a user who has restricted authorization to write files to most folders. For example, it cannot record activities of a user on an XP computer if the account type setting for that user is "limited", which causes XP to block them from saving files. Likewise, it may not save the report for some restricted Windows 2000 users, depending on the user properties. This is because these settings block Computer Use Reporter saving the report information while that user is on the computer. This program can easily be run on a network, allowing you to monitor computer activity on multiple computers from one computer. Computer Use Reporter is available as shareware ($25 individual fee, with volume discounts available). Try it for a month to see if you like it before you have to pay for it. Just download the install file to your computer, then run the file like a program by double-clicking on the install file in Windows Explorer or My Computer to install Computer Use Reporter. Remember that complete instructions are provided for uninstalling Computer Use Reporter if you decide that you do not like it. Computer Use Reporter runs on Windows 95/98/2000/NT/XP/ME. To see an excellent review of this product, click here.